Paul Carrack is celebrating his 40th year in the music business this year. He first burst onto the scene in 1974 with his band Ace and had one hit called How Long, which was not about a broken relationship, well, actually it is, but not between two lovers, but between Paul and his bass player Terry Comer who had been moonlighting in another band and Paul felt cheated because he had not told him. Ace broke up in 1977 and Paul, who was born in Sheffield, then embarked on a solo career, but also had stints as a member of Roxy Music, Squeeze and was also in Roger Waters’ backing group. In the mid-eighties, in addition to a couple of solo hit singles, he joined Mike and the Mechanics as joint lead singer with Paul Young (no, not that one). Because they were successful and having hits, Paul put the solo career on hold and concentrated on songwriting with the band. 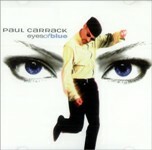 Following Paul Y’s death in 2000, Paul C became the sole lead singer until his departure in 1994. Interestingly, Paul only co-wrote two hits for the Mechanics, Over My Shoulder and Now That You’re Gone, all the other were penned by a combination of Mike Rutherford, Christopher Neil and B.A. Robertson. He resumed his solo career and came back with the heart rendering Eyes of Blue which, despite extensive radio play, only reached an insulting number 40 in the UK chart. Even a re-issue seven months later couldn’t help it as second time round it peaked at number 45. You would easily believe that most of Paul’s songs were written from the heart and about personal experiences, but a lot of them are not, that’s what makes him such a great songwriter. Some things defy explanation and as to why Paul isn’t more commercially successful, especially as a solo artist, is a mystery. His 1996 album Blue Views only reached number 55 and his only other two albums to sell enough to scrape into the chart were 2004’s Rewired, which got to 61 and 2012’s Good Feeling which stalled at number 46.